Invisible when not in use, a flame curtain is automatically activated in the event of a fire alarm sounding or a power failure. 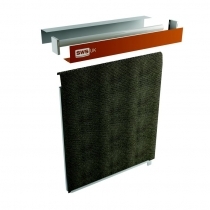 This ensures safety where it is needed without having to compromise on the aesthetics or design of a building. A flame curtain, when lowered or deployed, divides up large open spaces to slow down the spread of fire, allowing people to exit safely. The flame curtains that we supply are strong enough to contain a fire for up to 2 hours whilst still allowing a route of escape should this be required. This is achieved by lifting the bottom rail to create a gap large enough to go under.